شبکه‌های آبرسانی از جمله تأسیسات زیربنایی شهر‌ها و با هزینه‌های اجرا و بهره‌برداری زیاد است، لذا بسیاری از پژوهشگران بر روی حل مسئله بهینه‌سازی شبکه‌های توزیع آب متمرکز شده‌اند. 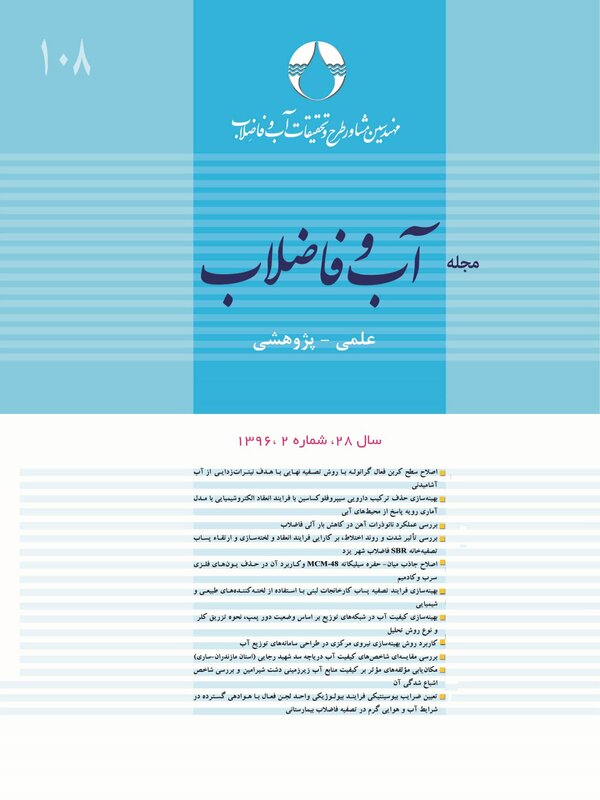 در اغلب پژوهش‌های اخیر در این زمینه، الگوریتم‌های بهینه‌سازی فرا ابتکاری تصادفی برای حل این مسئله استفاده شده است. در پژوهش حاضر، به‌منظور رهایی از نقاط ضعف الگوریتم‌های تصادفی، کاربرد یک الگوریتم جدید غیرتصادفی و قطعی به‌منظور کمینه‌سازی هزینه لوله‌های سامانه‌های آبرسانی بررسی ‌شد. الگوریتم به‌کار برده شده در این پژوهش، در واقع روش بهینه‌سازی نیروی مرکزی (CFO) اصلاح شده به‌منظور حل شبکه‌های توزیع آب است که CFOnet نامیده شده است. عملکرد روش پیشنهادی از طریق بهینه‌سازی قطر لوله‌ها در دو شبکه مرجع آبرسانی (شبکه دو حلقه‌ای و شبکه کادو) بررسی شد. به این منظور هر دو روش CFO و CFOnet در برنامه متلب برنامه‌نویسی و با نرم‌افزار هیدرولیکی ایپانت ارتباط داده شد. با اجرای این دو روش به‌منظور حل دو شبکه مورد نظر، بهبود عملکرد روش پیشنهادی CFOnet نسبت به CFO نشان داده ‌شد. به این وسیله، با اجرای CFOnet پاسخ بهینه برای طرح شبکه دو حلقه‌ای معادل 419،000 دلار پس از 12،432 مرتبه ارزیابی تابع هدف حاصل شد. همچنین طرح بهینه شبکه کادو با هزینه‌ای معادل 126،535،915 روپیه پس از 259،476 مرتبه ارزیابی تابع هدف، به‌دست آمد. مقایسه پاسخ‌های به‌دست آمده با نتایج الگوریتم‌های بهینه‌سازی تصادفی در ادبیات این موضوع، نشان داد که روش پیشنهادی نتایج خوبی برای حل مسئله شبکه‌های آبرسانی یافته است و در عین حال مزایای قطعی بودن یک روش بهینه‌سازی را نیز دارد. Water supply networks account for a major portion of the urban infrastructure requiring sizable funds for their construction and operation. This has encouraged many researchers to focus their efforts on optimizing water distribution networks. In most recent research in the field, stochastic meta-heuristic algorithms have been employed to address the problem. Given the many inadequacies of stochastic algorithms, the present study explored the application of a novel deterministic algorithm for minimizing pipe-sizing costs in water distribution systems (WDS). Methods: The algorithm used in this study is a modified version of the central force optimization algorithm called CFONet which is used for solving water distribution system problems. The performance of the proposed method was evaluated by optimizing pipe-sizing in two benchmark WDSs. For this purpose, both CFO and CFONet methods were written in MATLAB and interfaced with the hydraulic simulation model EPANET. Results and discussion: Application of the two methods mentioned above to two different water supply systems revealed the superior performance of the proposed CFOnet over its CFO counterpart. Thus, CFOnet yielded an optimum response for the deisgn of a double ringed system equal to US$419,000 after 12,432 runs of objective function estimations. Moreover, the optimum design of a CAdo system was obtained to cost 126,535,915 In. Ruppes after 259,476 runs of objective function estimations. Conclusion: Comparison of the results obtained in this study with those reported in the literature on other stochastic optimization algorithms showed that the proposed method yields satisfactory solutions for WDSs optimization problems while it also enjoys the merits of a deterministic optimization method. Afshar, M. H., Afshar, A., Marino, M. A. & Hon, M., 2009, "An iterative penalty method for the optimal design of pipe networks", International Journal of Civil Engineering, 7(2), 109-123. Alperovits, E. & Shamir, U., 1977, "Design of optimal water distribution systems", Water Resource. Research, 13(6), 885-900. Briere, F. G., 2014, Drinking-water distribution, sewage, and rainfall collection, Presses Internationales Polytechnique, Paris. Ding, D., Qi, D., Luo, X., Chen, J., Wang, X., Du, P. & Guo, Y., 2012, "Convergence analysis and performance of an extended central force optimization algorithm", Journal of Applied Mathematiecs Computtation, 219(4), 2246-2259. Eusuff, M. M., & Lansey, K. E., 2003, "Optimization of water distribution network design using the shuffled frog leaping algorithm", Journal of Water Resource Planning Management, 129(3), 210-225. Formato, R. A., 2007, "Central force optimization: A new metaheuristic with applications in applied electromagnetic", Journal of Progress in. Electromagnetics Research, 77 (1), 425-491. Formato, R. A., 2009, "Central force optimization: A new gradient-like metaheuristic for multidimensional search and optimization", International Journal of Bio-Inspired Computation, 1(4), 217-238. Formato, R. A., 2010a, "Improved CFO algorithm for antenna optimization", Progress Electromagnetics Research,19, 405-425. Formato, R. A., 2010b, "Central force optimization applied to the PBM suite of antenna benchmarks", Computing Research Repository. http://arxiv.org/abs/1003.0221. Haghighi, A. & Ramos, H. M., 2012, "Detection of leakage freshwater and friction factor calibration in drinking networks using central force Optimization", Water Resource Management, 26(8), 2347-2363. Haghighi, A., Samani, M.V.H. & Samani, M.V. Z., 2011, "GA-ILP method for optimization of water distribution networks", Water Resource Management, 25, 1791-1808. Kadu, M. S., Gupta, R., & Bhave, P. R., 2008, "Optimal design of water networks using a modified genetic algorithm with reduction in search space", Journal of Water Resource Planing Management 134(2), 147-160. Liong, S. & Atiquazzaman, M. D., 2004, "Optimal design of water distribution network using shuffled complex evolution", J. Inst Eng., 44(1), 93-107. Liu, Y., & Tian, P., 2015, "A multi-start central force optimization for global optimization", Journal Applied Soft Computing, 27, 92-98. Rossman, L.A., 2000, EPANET 2 User’s Manual, EPA/600/R-00/057. Journal of Water Resource Planning, Management, 123(2), 67-77. Schaake, J. & Lai, D., 1969, Linear programming and dynamic programming –application of water distribution network design, Report 116. MIT Press: Cambridge, MA. Suribabu, C. R., 2010, "Differential evolution algorithm for optimal design of water distribution networks", Journal of Hydroinform, 12(1), 66-82. Swamee, P. K. & Sharma, A. K., 2008, Design of water supply pipe networks, John Wiley and Sons, Inc., Hoboken, N.T.